The plumbing Code graphs, charts and tables etc were derived by experimentation, and for that reason these graphs and tables only cover the extent of the experiments. So what happens when we have situation that has a greater flow, or area, than what appears on the design charts? We know it is possible to design anything, (size doesn't matter.) the Snowy River was put in a pipe. A dam can have a side entry spillway. Which is the same theory as a side entry gutter, only bigger. The bottom line is there are standard hydraulic formulas out there that can calculate this stuff. Admittedly there are some other factors that come into play when the size gets smaller. For instance the water entering may fall in the middle, or side of the gutter. The height of the fall may have some effect. The roughness coefficients may be different. The energy and momentum coefficients may be different. However this is the advantage of having experimental results, these coefficients can be calculated and changed to make standard formulas fit the results. This is what I have done with these programs. However just be sure that this works, lets see how my formulas compare to formulas derived by a recognised Authority, eg CSIRO. Many years ago the CSIRO derived formulas for roof gutter design. The formulas were published in this document:- Roof Drainage by K G Martin Division of Building Research, CSIRO. 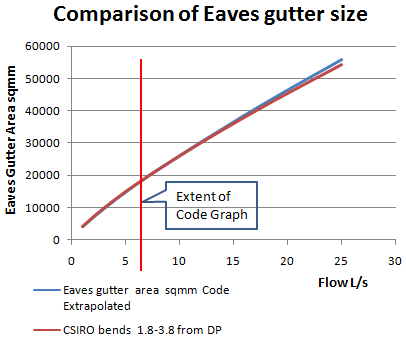 The CSIRO formula for eaves gutters has various alternatives. I have chosen to use the one relating to a down pipe at the end of the gutter and having a bend in the gutter between 1.8m and 3.6m from the down pipe. This gives results almost identical to the plumbing Code. As you can see there is a slight divergence at the higher flows but my formulas are on the safe side. (a)	Evidence to support that the use of a material or product, form of construction or design meets a Performance Requirement or Deemed-to-Satisfy Provision as described in A2.2. (ii) such other Verification Methods as the authority having jurisdiction accepts for determining compliance with the Performance Requirements. (d) Comparison with the Deemed-to-Satisfy Provisions. (b) by satisfying the required criteria when tested in accordance with a specified test method endorsed by a recognised certification body. We are relying on the fact that the CSIRO can be classed either as expert judgement, or an Organisation with recognised credentials. Activating the extra features allows a printout of the calculations. It is noted in the printout if the results are outside the limits of the Code graphs or tables. The result is then shown as "extrapolated", and corresponding to formulas developed by the CSIRO. "Roof Drainage by K G Martin".